Short details: NIELIT Scientist Recruitment 2018, National Institute of Electronics and Information Technology, Chennai has published notification Scientist 56 vacancies. Interested and eligible candidates can read Notification and Apply online before last date http://nielit.gov.in/. Admit Card download: To download the Scientist admit card, visit http://nielit.gov.in//, and enter the hall ticket details to view exam date. To know the Results: Results will be available few days after exam date, on nielit’s website. Short details: NIELIT Data Entry Operator Recruitment 2018, National Institute of Electronics and Information Technology, Chandigarh has published notification Data Entry Operator 17 vacancies. Interested and eligible candidates can read Notification and Apply online before last date http://nielit.gov.in/. Admit Card download: To download the Data Entry Operator admit card, visit http://nielit.gov.in//, and enter the hall ticket details to view exam date. 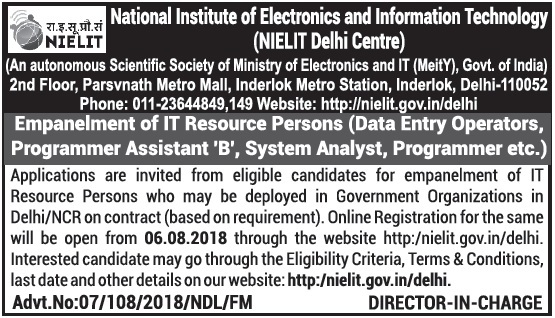 Short details: NIELIT IT Resource Persons Recruitment 2018, National Institute of Electronics and Information Technology (NIELIT) has published notification for IT Resource person vacancies. Interested & eligible candidates can read Notification & Apply online before the last date at https://www.nielit.gov.in. Age limit: The minimum age for IT Resource Person’s Vacancy is 35 years. The max age for NIELIT IT Resource Persons current Notification is 40 years. OBC 3 SC/ST 5 year’s relaxation. Application Fee: The Exam fee of NIELIT IT Resource Persons online application for Gen, OBC: 600/- and SC, ST, is 300l/-. Short details: NIELIT Recruitment 2018: National Institute of Electronics and Information Technology (NIELIT) for has published notification for scientist, assistant. Those Candidates who are interested in the vacancy details & completed all eligibility criteria can read the Notification & Apply. JOB TITLE Director, scientist, financial accountant, assistant, administrate officer, junior Hindi translator, senior assistant.